I adore these food-themed holidays, don't you? Nothing is more deserving of it's own celebration than a grilled cheese sandwich. Like mac 'n' cheese or chicken noodle soup, a grilled cheese is one of those dishes we love as children and continue to eat in adulthood because they make us feel good and simply because they taste so darn yummy! While I can appreciate the traditional grilled cheese sandwich made with bread, butter, and cheddar cheese, I really love a gourmet grilled cheese sandwich made with gourmet bread and fancy cheese. 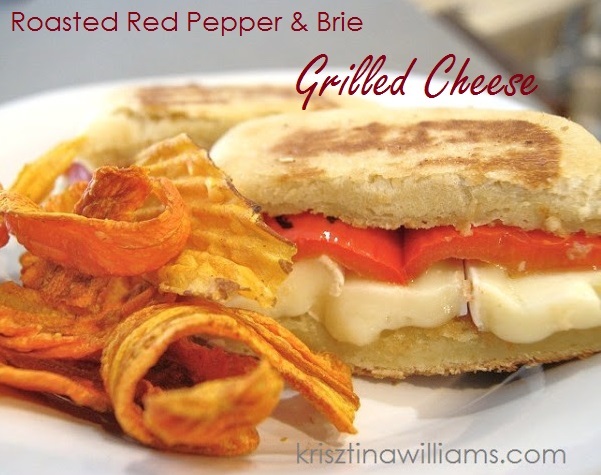 Previously on this blog I came up with my recipe for a Roasted Red Pepper and Brie Grilled cheese on Ciabatta Bread. Needless to say, it was one fancy grilled cheese (and absolutely delicious). In honor of national Grilled Cheese Day - April 12th, I'm rounding up ten delicious gourmet grilled cheese sandwich recipes, starting with my own. How do you like to make your grilled cheese sandwiches? Do you use any interesting ingredients or flavor combinations? Please share in the comments below. Now I'm off to make a grilled cheese for my lunch. Have a happy grilled cheese day! I do tuna melt or an egg and ricotta with tomatoes. Yum! I love egg on a grilled sandwich. That gouda with apple and bacon recipe looks good! Oh I know! I'm going to have to try that one. I love snacking on apple slices and gouda. We're pretty much traditional grilled chees and love Campbells tomato soup with it. Yum. You now make me want that for lunch, Krisztina! Your blog never fails to bring a happy smile to my face and my mouth to water. I've nominated you for The Versatile Blogger Award. If you care to accept this nomination, click on the link and follow the easy steps explained in my post.